Accrington's League Two game against Portsmouth has been called off because of a frozen pitch. The surface was covered overnight but after a pitch inspection at 10:00 GMT on Saturday, referee Trevor Kettle deemed it too dangerous to play. 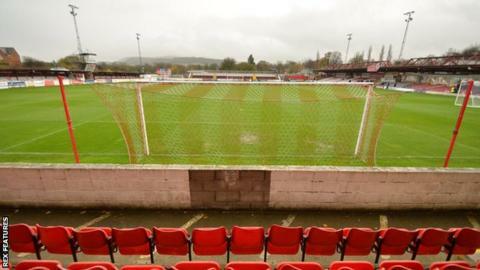 It is Accrington's fourth home game in succession to be postponed after their matches against Wycombe, Carlisle and Notts County were called off. They have not played at the Wham Stadium since 14 November. In a statement on their website, Accrington said: "A huge effort from staff, contractors, supporters and volunteers this week to ensure that this game went ahead, from relaying drains to covering the pitch with a double layer of covers yesterday. "Accrington Stanley would like to thank everyone that has helped. We share your frustrations, and those of the travelling supporters, at the loss of another home game." Accrington are currently seventh in League Two, five points behind fourth-placed Portsmouth, over whom they have three games in hand.